ELLICOTT'S ROCK / BAD CREEK TRAILS: 7 miles each (round trip) Trail head: Bull Pen Rd. Features: Ellicott's Rock is a rock embedded in the Chattooga River bank bearing the letters "NC" carved by surveyor Andrew Ellicott. He thought this to be the intersection of GA, NC, & SC. The actual point of intersection is Commissioners Rock, bearing the symbols NC/SC 1813, 10 feet downstream. Directions: Take Horse Cove Rd. 4.3 miles from the comer of Fourth and Main St. in Highlands to the end of the pavement. Take the right fork, Bull Pen Rd. Ellicott's Rock trail starts at 6 miles; the Bad Creek trail starts at 1 0 miles. Both drop steeply down from opposite sides of the river near Ellicott's Rock (left bank looking down stream) and continue down river. FODDERSTACK POPLAR: 100 yds. (round trip). Trail head: Rich Gap Rd. 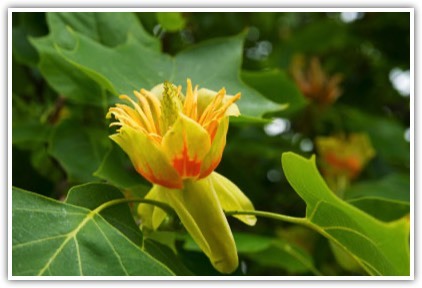 Features: Large yellow tulip poplar, the second largest tree of its kind in the state and third largest in the East. Directions: From the comer of Fourth and Main St. in Highlands, take Horse Cove Rd. 2.5 miles to a gravel road on the right, Rich Gap Rd. (SR-1710). Drive on this road about 50 yards to a pull-off parking area on the left. Look for the stairs across the street just beyond the parking area. WHITEWATER FALLS TRAIL: 0.6 miles (round trip). Trail head: Whitewater Falls parking lot. 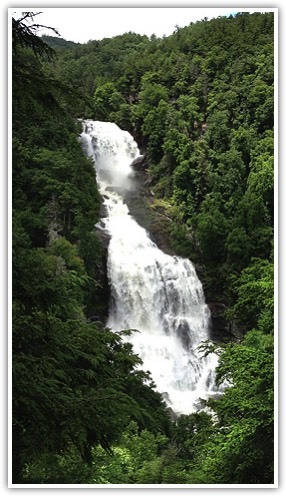 Features: Whitewater Falls is the highest in the eastern US (411 ft.)and is an easy walk on a paved trail. Directions: Take Highway 64 East to Cashiers, tum right onto Highway 107 South for 9.3 miles. At Whitewater Falls sign, tum left to SC 130. Continue 2.3 miles to stop sign and tum left onto Whitewater Rd. (SR-1171). Drive 1.1 miles to Whitewater Falls sign and tum right to enter parking area. An easy paved walk of 5-10 minutes leads to an overlook. To the right, the trail descends very steeply to the river. There is another overlook about 100' down this trail. To the left the trail continues to the river and fords the river. There are numerous places for picnicking as well as shallow pools for wading and quick dips. GLEN FALLS: 1.4 miles (one way; 15 minutes to first falls). Trail head: Glen Falls parking lot. Trail end: Forest Service Rd. (79-C) in Blue Valley. Features: Three cascading waterfalls and beautiful stream. One of the advantages of this trail is that you can return after seeing the first or second waterfall, and still have an enjoyable walk. Directions: From the comer of NC-106 and Main St. in Highlands, take NC-106 1.6 miles and look for USFS "Glen Falls Scenic Area" sign on left. Tum left and immediately tum right onto a gravel road. Take that road 1 mile to the end at the Glen Falls parking area. The trail continues in the same direction as the road. (The trail to the right goes to Chinquapin Mt.) The first spur trail back to the right goes to the top of the first waterfall, and can easily be saved for the trip back. THE NARROWS: 4 miles (round trip). Trail head: Whiteside Cove Rd. 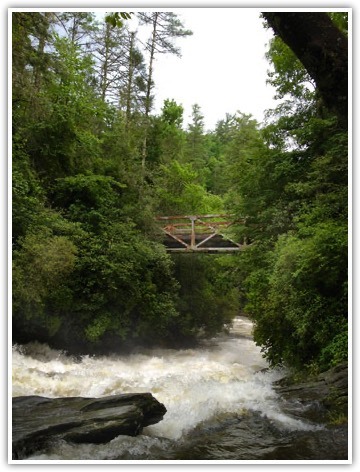 Features: Chattooga River forced into a narrow channel, cascading river, swimming hole. Directions: Take Horse Cove Rd. 4.3 miles from the comer of Fourth and Main St. in Highlands to the end of the pavement. Tum left onto Whiteside Cove Rd. and drive 0.9 miles. The trail is on a logging road on the right and descends 2 miles to The Narrows. You will pass a trail to the right, which continues to Bull Pen Bridge on Horse Cove Rd. Be sure to return the way you came. CHATTOOGA LOOP TRAIL: 2 miles (round trip). Trailhead: Horse Cove Rd. Features: A pleasant walk through the woods and then along the river, ending with a spectacular view of rock formations from Bull Pen Bridge, known as "The Iron Bridge." Directions: Take Horse Cove Rd. 4.3 miles from the comer of Fourth and Main St. in Highlands to the end of the pavement. Take the right fork (Bull Pen Rd.) and continue 2. 7 miles to a road on the left that goes steeply uphill to a parking area. Follow the logging road to the left for about 1 mile to another trail which descends on the right. Follow this trail until it intersects with the Chattooga River trail and tum right. The trail follows the river, passes sandy beaches, and intersects with a trail to the right, which takes you back to a parking area and Bull Pen Bridge to look down at the river. From the bridge, you can continue right on Bull Pen Rd. for 0.2 miles to the parking area, or return via the trail to the parking area. BARTRAM TRAIL: The NC Bartram Trail is a memorial to honor William Bartram, a naturalist who traveled through this area in 1775. The Bartram Trail crosses over some of the most scenic mountains of the state. 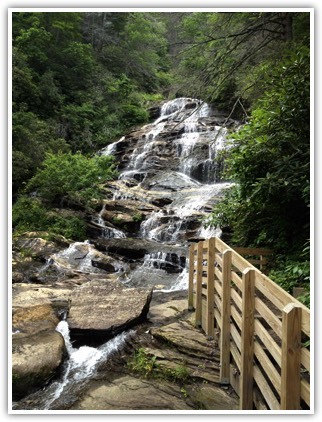 The trail offers many short or long hikes to spectacular vistas, such as Scaly Mt., Jones Knob, and Whiterock Mt. Maps can be obtained from the USFS. SCALY MOUNTAIN: 3.2 miles (round trip). Trail head: Hickory Gap Road (SR-1621). Features: Impressive views from summit of Scaly Mt. (4804 ft.) looking towards Georgia. 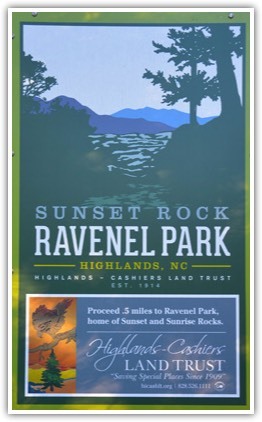 Directions: From the comer of NC-106 and Main St. in Highlands, take NC-106 4 miles to Turtle Pond Rd. (SR-1620). Tum right and go 0.2 miles to Broadway Gap. Take the left fork onto Hickory Gap Rd. (SR-1621) and go 1 mile to a USFS gate on the left. Park here and walk through the gate. At 0.3 miles, a trail bears to the right. Follow this trail for 0.8 miles and then tum right to reach the summit in 0.5 miles. This is the easiest route up Scaly Mt. Alternate Route: 4 miles (round trip). Trail head: Osage Mt. Vista on NC-106. Features: Small water-fall and views into Blue Valley and Georgia to the south. Directions: From the comer of NC-106 and Main St. in Highlands, take NC-106 5.7 miles. The trail begins at the stairs opposite the overlook and ascends steeply to a small waterfall on the left. At 0.8 miles the trail meets a logging road. Tum right and follow this road 0.6 miles to the spur trail to the top. Tum left and go 0.5 miles to the top, passing through several rock outcroppings. JONES KNOB/WHITEROCK MOUNTAIN: 0.6 miles (round trip) to Jones Knob; 4.6 miles (round trip) to Whiterock Mt. Trail head: Jones Gap. 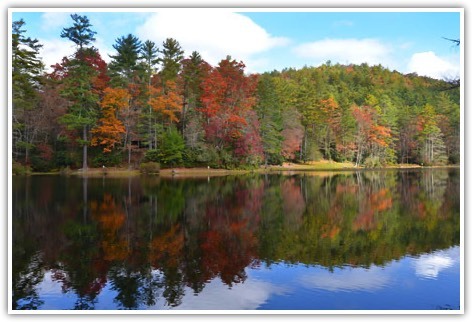 Features: Easy hikes, rock outcroppings, and views of the Nantahala Mts. to the west. CHINQUAPIN MOUNTAIN: 3.2 miles (round trip). Trail head: Glen Falls parking area. Features: Numerous stream crossings and several views from Chinquapin Mt. (4,160 ft.) into Blue Valley at vistas along the trail. 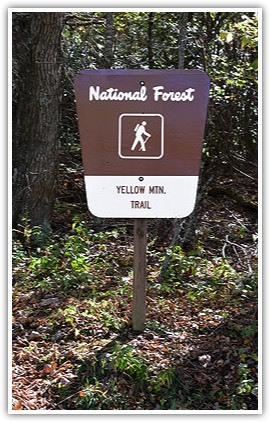 Directions: From the comer of NC-106 and Main St. in Highlands, take NC-106 1.6 miles and look for USFS "Glen Falls Scenic Area" sign on left. Tum left and immediately tum right onto gravel road. Take that road 1 mile to the end at the Glen Falls parking area. The trail begins to the right of the parking area. A moderate walk, the trail crosses a stream many times. Then a mile-long series of switch backs leads to the top of Chinquapin Mt. Alternate Route: From the comer of NC106 and Main St. in Highlands, take NC 106 2. 7 miles to a pull-over on the left with a large rock in the middle. The trail descends for 0.5 miles and, just after crossing a stream, intersects with the trail from the Glen Falls parking area. Tum right to Chinquapin Mt. SUNSET ROCK: 1.2 miles (round trip). Trail head: Horse Cove Rd., across from the Highlands Nature Center. Directions: From Highlands, travel east on Main St., past the shops and houses to the Nature Center on your left. Park in the parking area on the right side of the street. Follow the gravel road on the left side of the parking area. At the top, trails on the right and left go to overlooks. YELLOW MOUNTAIN/SHORTOFF MOUNTAIN: 3 miles (round trip) to Shortoff Mt., 9.6 miles (round trip) to Yellow Mt. Trail head: Cole Gap on Buck Creek Rd. Features: A short, easy hike to a view of the Buck Creek area; Shortoff Mt. has views to the South; Yellow Mt. has views in all directions. The trail to Yellow Mt. is a difficult trail, traversing three of the area's scenic mountains, with many steep ascents and descents. Directions: Take US-64 east from the comer of Fourth and Main St. in Highlands 2. 7 miles and tum left onto Buck Creek Rd. Continue for 2.3 miles on Buck Creek Rd. and look for the steps on the right. The trail very gradually climbs Cole Mountain, where a look-out on the left offers views into the Buck Creek area. It continues on the ridge line, and then a series of switchbacks takes you to the summit of Shortoff Mt. (5000 ft.). From there, the trail follows a ridge to Goat Knob and Yellow Mt. Gap. From the gap, one mile of switchbacks brings you to the summit of Yellow Mt. (5127 ft.). SLICK ROCK: 0.2 miles (round trip). Trail head: Bull Pen Rd. Features: Granite rock outcrop covered with mosses. The hike is a short one, but the summit offers an impressive view of the mountains. Because the slope faces directly east, this is a beautiful place to watch a sunrise. Directions: From the comer of Fourth and Main St. in Highlands take Horse Cove Rd. 4.3 miles to the end of the pavement. Take the right fork onto Bull Pen Rd. and drive 1 mile. On a sharp left curve look for a pull-off and steep unmarked path on the right. If you pass a road which intersects Bull Pen Rd. on the right, you've gone too far! HURRAH RIDGE/WEST FORK TRAILS: 2.1 miles (round trip). Trail head: End of Blue Valley Rd. (FS79). Features: The Hurrah Ridge trail is part of an historic trail used by Blue Valley residents to drive livestock up to grazing grounds in "The Flats" of Scaly Mountain. Directions: From Highlands, take Highway 28 south approximately 6 miles to Blue Valley Road. Tum right and follow this road, which turns to gravel, for 6 miles to its end. Take the trail to the right, without crossing the stream. The trail ascends 1 mile and intersects with the Bartram Trail. Take the Bartram Trail to the left for 0.5 miles and then tum left onto the Hurrah Ridge Trail. This trail descends for 0.6 miles, crosses the stream, and returns to the starting point. WHITESIDE MOUNTAIN: 2 miles (round trip). Trail head: Whiteside Mt. parking area. Features: This moderate loop trail offers spectacular views from a high ridge top, 2,100' above the valley floor. Whiteside Mt. 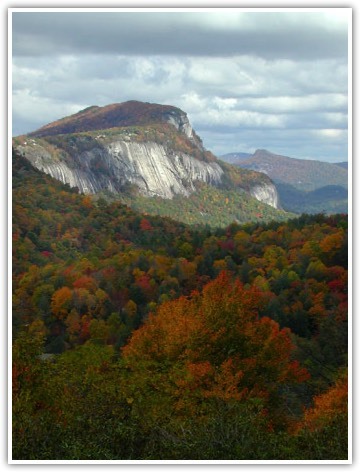 (4900 ft) has the highest sheer cliffs in the Eastern US (400 -750 ft.). Directions: From the comer of Fourth and Main St. in Highlands, follow US-64 east for 5.4 miles. Tum right at the second entrance to Wildcat Cliffs Country Club, which is Whiteside Mt. Rd. (SR-1600). Follow this road for 1 mile to a parking area on the left. From the parking area, take the steps to a rocky road that gradually ascends the back of the mountain. Continue up the road to a clearing at the top. The trail continues to the right, goes along the cliffs, and then returns to the bottom of the road, eventually descending some fairly steep stairs. CLIFFSIDE LAKE RECREATION AREA: There are numerous hiking trails in the area, including an interpretive loop trail describing shrubs and trees along the Clifftop Vista Trail. The half-mile loop around the lake offers hikers an easy walk that is quite level. Directions: Take US-64/28 from the comer of 4th and Main in Highlands (toward Franklin) to USFS Cliffside Lake sign, 4.2 miles. Tum right and follow the road to a parking area near the information shelter. A map there shows the location of different trails.